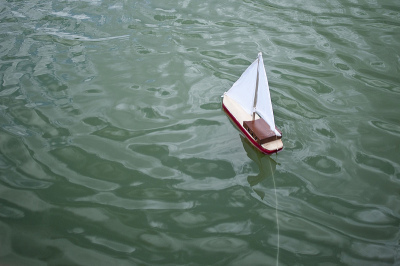 Tom had just finished making his own toy boat. He brought the boat to the edge of a river and started to let out the string tied to it. He was admiring how smoothly his boat cut through the water when a strong current took hold. Tom tried to pull his toy back to shore but the current was too strong and the string snapped. He spirited along the bank to catch it, but soon his boat drifted out of sight. He desperately searched for the boat until darkness set in. Unsuccessful, he finally gave up the hunt. Several days later Tom was walking home from school and passed by a toy store. A certain boat caught his eye. He pressed his face against the store window to get a better look and sure enough, it was his lost boat. He ran inside and told the manager, “Sir, that's my boat in your window. I made it myself.” The manager replied, “Sorry, son, but someone else brought it in this morning. If you want it, you'll have to buy it.” Tom hurried home and counted all of his money; he had just enough. He rushed back to the store and purchased his beloved boat. As he walked home he held the toy tightly to his chest and said, “Now you're twice mine. First, I made you and now I bought you” (Good News Publishers, “The Boy Who Lost His Boat”). This touching story perfectly illustrates God’s relationship with us. He created everyone and everything. He designed, crafted, and breathed life into each one of us. Sadly, people still drifted away from God by the sweeping currents of sin. In order to bring us back, God decided to pay a substantial price; He gave His own Son to die (John 3:16). With this sacrifice God now owns us twice. He made us and he bought us. Our Lord is beyond deserving of our love, worship, and above all else, obedience. Let’s remember that we belong to God and serve Him in all we say and do.